I'm (almost) 16, and have been to the US Capital, Washington DC for a school trip! Today’s your lucky day! Poptropica’s coming to iPad! Poptropica has just announced that they will soon be releasing their new iPad app, where you will get to play the actual online version of Poptropica (with music) on iOS! What do you guys think of this development? Tell us your thoughts in the comments! The Forgotten Islands app and first PopTopics book are here! Hey guys! It’s been so long!! 😀 The SATs are coming up and school has begun, but I’ve resurfaced to tell you that the Forgotten Islands App is OUT! Check it out! UPDATE: The PHB’s complete Forgotten Islands iOS Game Walkthrough is now available! Poptropica: Forgotten Islands features an original storyline that spans several new island groups. Dig through the past to discover relics that reveal Poptropica’s hidden secrets. But watch out for competing explorers, natural threats, and the artifacts’ unfriendly owners! The navigation looks like something similar to Skullduggery when you take on the open seas — except this time in your magic school bus blimp! Aside from that mentioned above, you can also customize your character with some all new costumes and some old ones, using the coins you have collected! Here’s the catch: To play this all new adventure, you have to pay $4.99 on the Apple Store. Seems reasonable, seeing as how they need funding, but I’ve never seen an app where you had to pay that much on iOS ever. But who knows? They put a lot of work into this. On a lesser note, the Creators have released a non-fiction book series called PopTopics. These books will talk about the topics that have inspired our Poptropica experience (clever naming, by the way 😀 ). The first one is on Mythology! 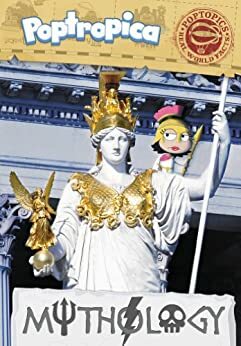 The first book, Poptopics: Mythology, gives you the inside scoop on the Greek legends that gave rise to Mythology Island. You’ll discover what we got right, what we got wrong, and what we left out. You might be surprised to find that truth is stranger than fiction! Speaking of which, the Creators have hinted at more books: from “space travel” (Lunar Colony) to “monsters” (Cryptids), and even the Wild West (well, this is self-explanatory 😉 )! Well, I’m off. Hope you guys enjoy playing The Forgotten Islands! Need a quick Father’s Day gift? – 30% off Poptropica Shop! Hey, it’s Shaggy here! Now that it’s summer, I believe I can post more often, if no one beats me to it. Well anyway, if you need a quick Father’s Day gift idea, the Pop Creators are offering this great deal! Hmm, pretty cool! Well, anyway, you can give your dad their son/daughter’s Poptropican on a shirt! “01110100011010000110000101110100001001110111001100100000011000010010000001110111011100100110000101110000!” That’s a wrap! as Binary Bard says on the Creators’ Blog, because we have our top 10 finishers for Back Lot Island! WOOHOO! and last but certainly not least 10. SKINNY DRUMMER of WILDFIRE! Congrats to all who finished and enjoyed Back Lot! Also, if you haven’t noticed, our Back Lot Island page has just been newly updated with our guide, kindly written by Samwow5, skyboy303, Zippy Turtle, and edited by Slanted Fish! Also, some trivia has been added, not all of them, but a few of the little movie tidbits that you can find! If you can find more, just comment on this post or the BL Island page! AND CUT! THATS A WRAP! Right up until the last minute, we hoped it was a rumor. But it happened — the Poptropolis Games have returned to the seas from whence they came. Will the Poptropolis Games ever come back to the surface? Let’s hope so! Here lies the grave of Poptropolis. But wait! There’s a message that was left for us! There may be hope yet that it isn’t dead! Why? On the members cards, it says Poptropolis 2012. This may not be the only year that they rise. Also, as Slanted Fish said, it could follow the time of the Olympics and other ideas sugest that Poptropica Time is faster than ours. And even more shocking news! The Games Forever and myself have access to the island because we saved our characters. IF you happened to save yours on the Island, there’s STILL TIME for your medal to be won! Any last words for Poptropolis Island? Leave them in the comments! Shaggy Tornado with BREAKING NEWS! Uh oh! There’s water on the island! So let’s follow the Creators’ suggestion! Go play Poptropolis Games NOW before it sinks forever by January 24! Take our handy walkthrough with you! NOW GO! Actually, don’t. I still have some story to tell. So you know how the Creators released the trailer for Night Watch Island? Well, they also released the Night Watch Members’ Pack! Interesting. Hopefully, we’ll get a release date soon! But I think none will top Zomberry Island in my opinion. 😛 Check out the Island Help page for the Night Watch trailer, discussion, desktop wallpaper, printable poster, and tour for more info. Have a great weekend! 🙂 Cheers! Hmm, it does seem to be sinking further and further down compared to what BT took last. So what do you guys think? Are they sinking back into oblivion for the next 100 years? Or is it something else? Leave your speculations in the comments! If the island is, in fact, sinking, I think you better finish Poptropolis Games and fast!